Can you Make pizza dough using KitchenAid Mixer- Is it the best Mixer out there? There is a lot that I have heard about the Kitchen Aid Mixer and it got me all interested in what is so special about this device and if it is the best pizza dough mixer out there! Usually, if I have to make a pizza just for myself then I go ahead and knead the dough with hands, for some reason it just feels good to knead pizza dough. However, the task gets really tedious if you are hosting a pizza party and want to cook a pizza for a group of people. It can be a family gathering or your friends coming to your place to hang out either way, you need to be able to knead the dough really fast in order to accommodate all the hungry guests. This is the main reason I like to go for a pizza dough mixer and after hearing a lot about the one from Kitchen Aid, it got me really interested in this mixer wondering if was really worth the money. There are a few variants, so I would discuss the ones that are hot selling at the moment. If you have owned a Kitchen Aid Mixer, do let us know your experience with it in the comments below. However, for now, let’s discuss some really good mixers from this brand. This is probably the best selling pizza dough maker on Amazon and to be honest, it does deliver what it promises. Apart from the excellent features, you do have a lot to explore with this mixer. You can easily knead the pizza dough really quick giving you an upper hand in comparison to doing it the old fashioned style. The mixer is undoubtedly amazing and you have different settings and different attachments that can help you even make pasta from scratch. The different uses of this mixer along with various attachments make it stand out and if you want a top quality mixer then you have to check this one out. 1. There are so many things that you can do with this mixer because of the different attachments that come along with it. 2. If you are a passionate baker then you would love this appliance in your kitchen. Personally, I love it as it makes kneading dough or mixing a batter so much easier and saves a lot of my time and energy. 3. It is pretty easy to clean and maintain as well. 4. If you look at the device you are going to fall in love with the design and finish instantly. it comes in different colors so you can match it with the design of your kitchen counter and have something that would look really gorgeous. 1. There are many customers who have received defective products, so once you get the device delivered to your place, make sure everything is working fine. This was the other mixer that we felt was pretty famous on the mixers category on Amazon and it is slightly lower in price in comparison to the first one. If you are just looking for a mixer that would knead your pizza dough then this one is more than enough, however, a major difference between this one and the one above is the capacity of the mixer. If you want this mixer for a small family then it would be perfect, however, if you want something with larger capacity then you have to go for the one above. You have pretty much similar attachments and features of both these mixers. There is not a lot of difference since you do get around the same number of attachments and you can play around by making different dishes inside this mixer as well. The pros and cons of the mixers are very similar but just to get some clarity do take a look at this one from KitchenAid so that you make a better purchase decision. 2. There are a lot of different dishes that you can make with the help of this mixer. Honestly, there was not much f a difference from this one and the previous one, just that if you are looking a larger capacity mixer which always is a good thing then you can go for the one above. 4. If you look at the device you are going to fall in love with the design and finish instantly. Sadly, this one comes here in just one color but you are anyway going to love it since its all white and looks really elegant. 1. There are many customers who feel that the quality of the device is going down by the day. I would highly recommend that you check everything when you receive the device in order to avoid such issues. So, this was the two hot-selling mixer models from KitchenAid and they probably have thousands of satisfied customers that are all praise about both these mixers. So, if you are looking for a mixer that would help you knead pizza dough really quick then you should definitely get these as they are amazing. If you like the post then do not forget to share it on social media! 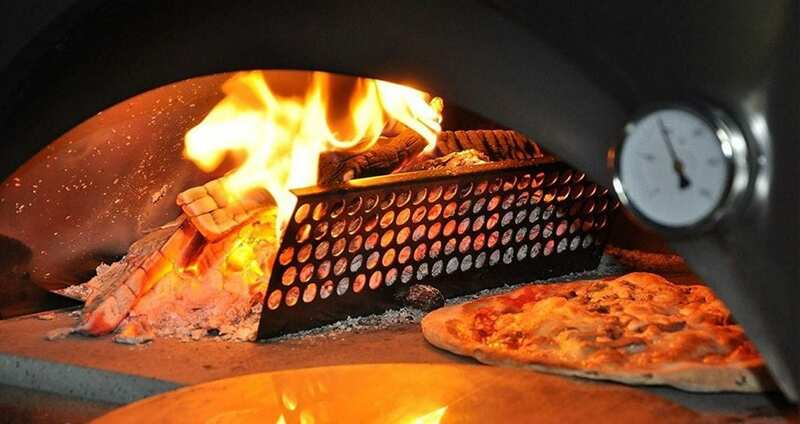 In this post, we would list the best wood-fired pizza ovens in the UK and rate them according to their price, functionality, and ease of use. Who doesn’t like to make a wood-fired pizza at home? They are delicious with that wood char flavor making it a perfect way to get entertain a gathering of family and friends. I like making Pizzas and love eating them, this is how it goes for most of the Pizza enthusiasts. But, it is not that easy to find the perfect wood-fired pizza oven that is both economical and at the same time comes with amazing features. This post is concerned with people living in the UK as there are a slightly different pizza oven options in the UK than compared to the rest of the world. So, if you are from the UK then read on as this list would help you find your perfect pizza oven. In this list, we would recommend wood-fired pizza ovens that work great and are relatively less expensive than the traditional wood-fired pizza ovens. Now, they might be smaller than size but we promise you that they would work as efficiently and you can get them online without having to run all around the town to get the perfect oven for your home. The Uuni or now the Ooni Pizza ovens are probably the best out there. They are light in weight, fuel efficient and the least priced of all the pizza ovens in the list. The Uuni 3 Pizza Oven can cook a pizza within 1 minute which makes it super fast and efficient especially if you are trying to host a party with a couple of people. It is a wood pellet pizza oven so the fuel can be wood pellets here which are really efficient, however, you can even use wood or coal as other ways of fueling this pizza oven. The pizza oven is light and portable so you carry it around with you on trips as well. Overall, the Uuni 3 pizza Oven is perfect for someone who is looking to makes pizzas inside a really nice and affordable pizza oven. 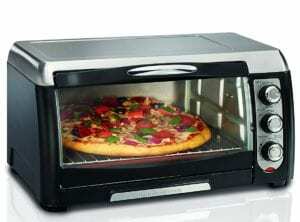 – It can cook pizza in less than a minute which is AMAZING. – The Pizza oven has good heat retention. – You have to use wood pellets instead of wood which definitely increases its energy efficiency and even makes it eco-friendly as there is less smoke emitted. – You can host a pizza party with this amazing pizza oven. – The Uuni 3 Pizza oven is really light and you can carry it around easily anywhere. If you wish to take it on a trip then you can easily do that since it is an extremely portable pizza oven. – The pizza oven has a shiny metallic finish and that remains only until the first use. Once you have started cooking in it the color changes because of the heat and smoke. Now, this oven might be on a little expensive side but it is more like an upgrade to the Uuni 3 Pizza Oven. A few major differences between the two pizza ovens is that the Uuni Pro is a little larger in size. Being larger in size, you can easily fit in an iron skillet and cook other dishes or vegetables without any issues. This was not the case with the Uuni 3. In the Uuni 3, there is just enough space to insert a pizza. Another point that you should consider that this oven is multi-fueled, so you can use it as a wood-fired pizza oven or a gas-fired pizza oven as you like. The pizza oven has an amazing door design as well that lets you slide in your pizza and pull it out once you are done with the cooking. It has two doors so that you can take a peek inside the pizza oven while the pizza is being cooked without removing it out. – You can use wood, charcoal, pellets, gas as you fuel which is pretty amazing. – The Pizza oven has good heat retention and you can easily cook a whole batch of pizzas inside this oven without any issues. – This pizza oven is super fast. You can cook a pizza in less than a minute which means you can just cook a whole batch at once. Uuni Pizza ovens might look small but they are amazing when it comes to cooking a pizza really quick. 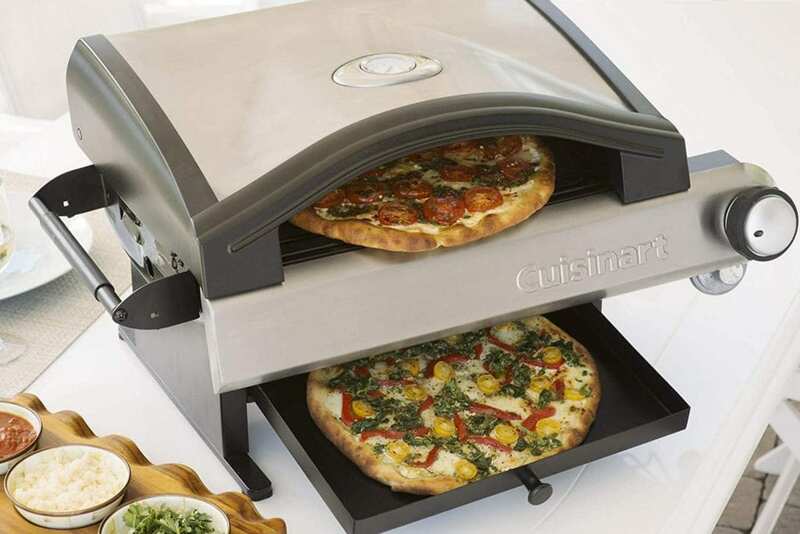 – The pizza oven gives your pizzas a nice authentic taste and cooks the base perfectly. The toppings and cheese are soft and creamy while the base is crisp which is all a pizza lover needs. – It heats up really quick and the box includes- Uuni Pro Oven, Stone Baking Board (4 parts), Door With Thermometer, Pizza Door, Wood & Charcoal Burner, Safety Gloves, Uuni Pro Manual, Allen Key for assembly and adjustments. – You cannot cook more than one pizzas at a time but the fact that you can cook pizza faster makes up for this con. This is another budget pizza oven that you can use in order to cook up some really great pizzas. Now, this pizza oven might require you to now a few tips if you want to cook a perfect pizza but once you are acquainted with the oven, it works like a charm. You can even use this pizza oven to roast vegetables or meat making it a really versatile device. The Pizza oven does need a good amount of fuel if you want to maintain its temperature. You need to fill up more than half of the tray if you want to maintain the temperature inside the pizza oven. However, many users have said that you can easily maintain the temperature once you have put enough fuel inside the pizza oven. The La Hacienda comes with a 12-inch pizza stone and while you are not cooking pizza, there are a ton of other dishes that you can try cooking inside the pizza oven. – You can use wood to start a fire inside the oven. – The Pizza oven is easy to assemble and all that you need to follow the manual and you would be able to get started within a few minutes. 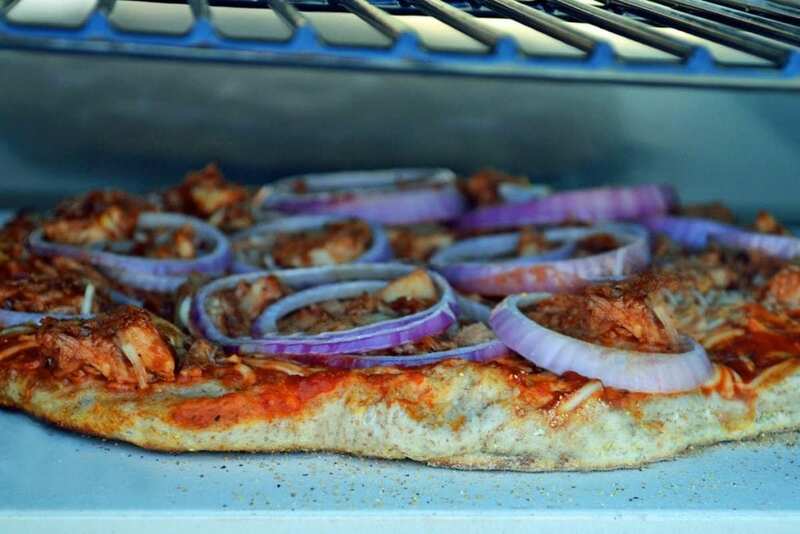 – This pizza oven is multifunctional, you can cook pizza inside the oven and when you want to just use it as a grill, you can do that as well. This opens up the possibility of using this pizza for a lot of different dishes. – It is not as portable as the Uuni 3 or the Uuni Pro Pizza oven so that can be an issue. Otherwise, it is movable because of the stand having wheels. This Pizza Oven is a more like a traditional countertop wood-fired pizza oven and the pizzas cooked inside the oven are simply delicious. The Pizza oven is pretty spacious and you are going to start a fire in the corner so that you can coo your authentic artisan style pizza inside the oven. Overall, this pizza oven is great outdoors and as a wood-fired pizza oven, you are really going to love everything about it. It is pretty good when it comes to heat retention and most of the users who got this oven was happy and satisfied with how well it cooked pizzas. You can cook more than one pizza at a time and it can easily cook one pizza within 2 minutes which is really fast. The oven is perfect for commercial use as well but ideal for family get-togethers. You can even take this oven on camping and other outings and set it wherever you end up camping. 1. The oven comes with a thermometer that will tell you the dome temperature inside the oven and you can accordingly cook your pizzas when you feel that the temperature inside the pizza oven is ideal. 2. The outer surface of the pizza oven is aluminum and the inside is made up of stainless steel in order to keep the oven strong even during high temperatures. 3. The oven heats up pretty quick and within 20 minutes, it reaches the perfect temperature for you to start cooking your pizzas in the oven. 4. The oven uses wood as a fuel and you might end up using 1-2 kgs of wood in total and the exact quantity depends on the moisture content of the wood being used. 5. The Maximus claims to make around 30 pizzas in an hour which is pretty good considering you are buying it for parties or trips where you want to feed a group of people. 1. The pizza oven is going to be bulky and you might have problems initially if you are trying to move around with it. 2. You might need to clean the residues properly before you use the oven again. Using it without cleaning the insides might result in ashes on your pizza from the last time. 3. You have to be very quick when it comes to cooking the pizzas and cannot leave the oven without someone seeing how far is the pizza from being done. These are all the wood-fired pizza ovens that we thought were pretty good in the UK. If you think we missed any pizza oven then do tell us. Check out these pizza ovens and let us know what you think in the comments below? If you liked the post and know a pizza enthusiast like us then do not forget to share this post on social media! What is the Best Pizza Oven Temperature? So, what is the best Pizza Oven Temperature? This question has haunted me for quite some time especially when I was a beginner and just getting started with making pizzas. I had to experiment a lot to figure out when the pizza was cooked the best and for how long was I supposed to leave it inside the Pizza Oven. Believe, it or not, as a beginner it did take me about 20 average cooked pizzas to get my Pizza Temperature game perfect. The thing is you have to keep a balance with the temperature and timing. If you are making pizzas at home then simple answer to this question is the maximum temperature your oven can reach. While cooking a pizza its really important that the oven is really hot and the higher the temperature the better is the cooking. While most of the Pizza recipes suggested 475 degrees Fahrenheit, I used to usually set my oven at this temperature and it takes about 10 minutes for the Pizza to cook evenly. The Answer is, the higher the temperature, the crispier is your pizza base is going to be. If you are making pizza at home then make sure your oven is cranked up to the highest temperature. 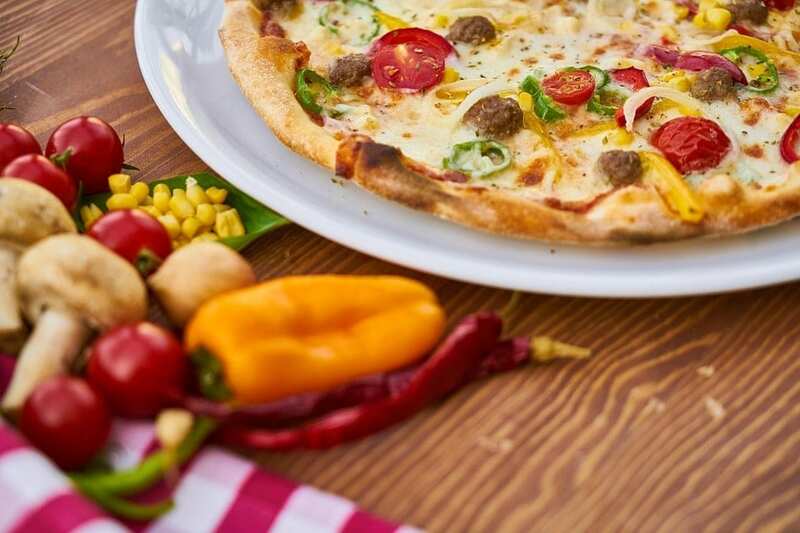 If you have a dedicated pizza oven then the temperature has to be around 600-700 degrees Fahrenheit so that you get the perfectly cooked pizza. The Pizza can be cooked within a minute or two when you have the oven at the higher temperatures. When cooking at home in an indoor oven, it can surely take 10 minuted or sometimes, even more, depending on the crust. The Pizza Crust is a deciding factor? Not really, If you have a thin crust pizza or a thick crust, higher temperatures are preferred when it comes to cooking a pizza. However, the thin crust pizzas will get cooked really fast in comparison to deep dish Pizzas. But when cooking at home, a deep dish pizza is definitely going to take a really long time and in most of the cases it does not turn out that well for me. However, making a deep dish pizza with a pizza oven is just amazing as you get to see some really good results and honestly, the pizza tastes way better than the ones you get in the commercial pizza outlets or restaurants. So, think or deep dish, make sure to crank the pizza oven to the highest temperature that it would reach so that you get the perfect cooked pizza. When it comes to cooking in wood-fired pizza ovens or outdoor pizza ovens then the common question is how hot is way too hot for cooking. And the answer to that question is as hot as your oven can go. The wood-fired pizza ovens can ideally reach temperatures in the range of 700-800 degrees Fahrenheit and that is honestly a perfect temperature to get your pizza base all crispy with gooey and well-cooked toppings. However, there are people who do not like their pizza base all charred and burnt, so in that case, going for slightly lower temperatures like 700 or 650 degrees Fahrenheit works well. On these temperatures, your base is golden brown and crisp. Also, this is works really well with thin crusts. For deep dish pizzas, the temperature is going to be the same just that you have to experiment with the temperature and time that works the best. Can you get perfectly cooked pizzas with your home oven? 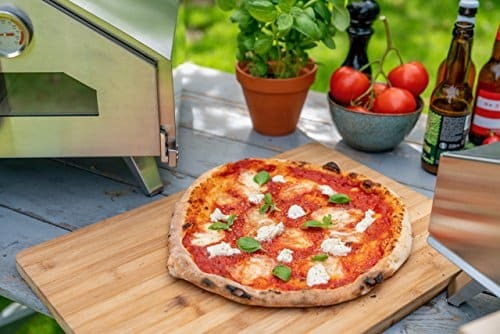 Outdoor pizza ovens are the best when it comes to getting the perfectly cooked pizzas, however, one of the questions that remain is whether they are the best when it comes to cooking a pizza. If your oven can go to 500 degrees Fahrenheit then you probably can cook a decent pizza with your oven. Thin crust pizzas would be amazing to cook inside your oven and to get the best out of it, you should experiment with different thickness of the pizza crust. Mostly, you would be satisfied with medium to thin crust as they are perfect for home ovens. Honestly, I love thin crust pizzas so I may not be able to give you a lot of tips with deep dish pizzas, but you HAVE to experiment with your oven as every oven is different. Once you get the hang of it, cooking pizzas are going to be a breeze. The rule of thumb here should be that you need to set your oven to the highest temperature in order to get the best-cooked pizzas. Preheat your oven before you get started with the cooking. Do not shove your pizza inside the oven when the oven is cold. Make sure that the oven is really hot and if you have a pizza stone then that should be inside the oven while you are preheating it. The hot stone and the preheated oven is going to cook your pizza to perfection. Usually, preheat my oven for about 15-20 minutes at the highest temperature. You can experiment with the time but this works just perfectly with my home pizza oven. 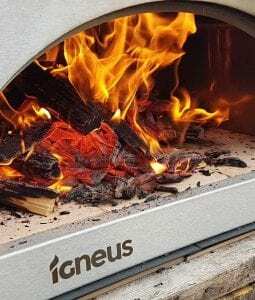 If you have a wood fired pizza oven then make sure that you keep adding wood every 15-20 minutes so that the temperature inside the oven remains constant. Another tip would be to turn around the pizza in a wood fired pizza oven so that it gets cooked evenly. This is not the problem with home ovens as there is a piece of inbuilt machinery that rotates the pizza inside the oven. I hope you found this post helpful and do let us know at what temperatures you have been cooking pizzas at home? If you are looking for the perfect outdoor pizza ovens then Uuni has to be our favorite! Found this post helpful? Do not forget to share it on social media! Filed Under: Countertop Oven Tagged With: Best Pizza Oven Temperature, Best Temperature to Cook a Pizza at Home, Best Temperature to Cook Pizza at Home, Perfect Temperature to cook pizza at home, Temperature to Cook Pizza at Home, What is the Best Pizza Oven Temperature? The best temperature to cook pizza at home had been my question for a really long time. If you are a beginner then you would know that cooking the perfect crispy crust pizza can really be a task. I had struggled for a really long time with my home oven. There were times when the base was just not cooked properly and sometimes I even ended up with a soggy base. The soggy base situation was sorted later but even then I just could not figure out what had to be done so that the base comes out crispy. I was setting my oven at 450 degrees Fahrenheit and still did not get the pizza base cooked to my liking. If you are in a similar situation then you are going to love this post as we would share how to get the pizza cooked perfectly at home. If you are thinking about the perfect temperature then let me tell you, 475 degrees Fahrenheit, the temperature that you see in every recipe is not a mandatory temperature at which you need to cook your pizza. You basically need to crank up your oven to the highest possible temperature. So, if your oven can do a 550-degrees Fahrenheit, then 550 degrees Fahrenheit it is! You need to understand that the hotter your oven is, the better is your pizza base. So make sure that you preheat your oven and make it like extremely hot so that it is ready for cooking pizzas. Do not shove your pizza inside a cold oven as it is just not going to cook that well and if you are using a pizza stone make sure that it is inserted inside the oven while you are preheating it. So, the general rule of thumb is to go for the highest temperature in order to get that crispy base. Now, once you are sorted with temperature, you need to set your timer accordingly. Make sure that you keep checking your pizza and make sure that it is not overcooked or burned. Honestly, you need to make sure that the crust is cooked to perfection and for that, it does take some trails and errors. I usually cook my pizza for not more than 10 minutes but when it is at 475 degrees Fahrenheit. If you are cooking at higher temperatures then it is definitely going to take you very less time in comparison. You can cook your pizza in 6-7 minutes as well if you preheat your oven at increase the temperature. The pizza comes out really crispy and the toppings are cooked to perfection. The cheese on the top of the pizza is melted really well too so you get that soft and gooey cheese on top with well-cooked toppings and a crispy base. How hot is way too hot?? Honestly, there is no such thing as way too hot for a pizza oven. The hotter the pizza oven, the better is your pizza. In case of a wood-fired pizza oven, the temperature is upto 700-800 degrees Fahrenheit and the pizza that comes out is cooked perfectly well. 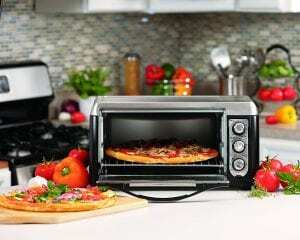 So your home oven is definitely not going to reach those temperatures and your pizza is not going to get burnt. Just make sure that when your pizza is being cooked, you have preheated the oven and you keep a watch on the pizza. When the pizza looks ready(basically when you the toppings charred a bit and the base turned golden brown) you can stop cooking. So, do not worry, nothing is way too hot for cooking a pizza, if your oven is way hot then make sure that you set the timer accordingly. If you watch the pizza it just gets easier to make sure that you are not burning it(which is rare in a home oven) so yes try this trick and hope your pizza turns out the way you want it to. Do try this trick if you haven’t already been doing it and let us know what you think about it in the comments below! If you liked the post then do not forget it on social media!